If you’ve ever borrowed money from a bank, you’re probably familiar with the Bank Of Canada’s (BOC) key interest rate. It’s the interest rate the BOC sets on loans banks must pay on money they borrow from each other, that ultimately sets the cost of borrowing money for all Canadians. And this is subtly very important because our economy works by people investing in ideas and realizing business opportunities, both of which require money and create jobs. The higher the interest payments on a loan, the more risky loans become. In the 1980’s, interest rates were near 20%, meaning you would pay interest of $20 per year on a loan of $100. Compare the 1980’s to today where interest rates are at a near record low of 0.75%, or 75 cents per year for a $100 loan. It becomes clear that buying a home or starting a business would be virtually impossible in the 1980’s for a lot of people who have done just that today because of much lower interest payments on loans. Money was just too expensive in the 1980s. A rock bottom interest rate is the biggest reason for Canada’s housing market being as frothy as it is. If you look at interest rates over the last 25 years, you’ll see that the steady decrease in the interest rate over the decades matches an equally steady increase in the cost of a home in Canada. At 20% interest in the 1980’s, you would have paid the banks several times the value of your mortgage amount by the time you finish paying off the home. Today, you just pay twice the value of your mortgage, if that. Being able to control interest rates is a powerful tool used by the BOC (and the Federal Reserve in the US, and other central banks around the world) to help steer the economy. It is one of several tools the BOC has at its disposal in managing the Canadian economy and financial system. 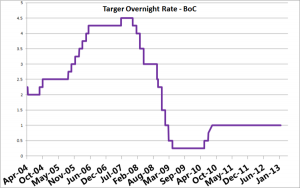 The BOC’s key interest rate is the interest rate that banks use when they borrow money from each other, otherwise known as the over night rate. Banks will transfer billions of dollars between themselves throughout the course of a day. They will conduct transactions on behalf of their many clients, at different times during the day (as the value of the Canadian dollar fluctuates), and across different currencies. As a result, at the end of a business day, their numbers typically don’t add up. Some banks end up with more money than they should, others end up with less. To make sure they have enough money available to conduct their near-term business, banks will typically borrow from each other at the end of a day.To minimize the risk of banks defaulting, the BOC dictates that they must have a certain amount of cash on hand, to prevent 2008 American-style bad loans undermining the whole system. So often banks need borrow money just to conform to BOC regulations. The money banks borrow from one another at the end of the day is what the key interest rate actually applies to. The over-night rate doesn’t directly apply to anyone but the big financial institutions. Because banks are for-profit organizations, they will always pass down the key interest rate to all their other interest rates, such as mortgage rates, but with extra interest added for them to make profits. Thus, by controlling the interest rate on the main source of money for financial institution funding, the BOC is able to determine interest rates for everyone else downstream, because banks will always lend out money at the current interest rate, plus a little extra for the banks themselves. 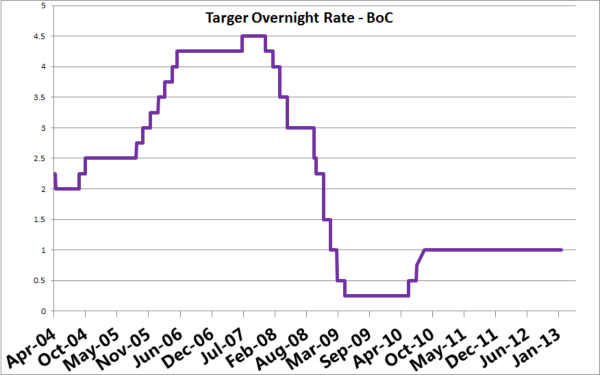 When I first discovered the great power the BOC wields, I wondered why the BOC just doesn’t keep interest rates at 0% to make money more easily available to everyone. But unsurprisingly, the more you know, the more you realize how important, complex and entwined the economy is. The short answer to why interest rates aren’t at 0% is because that’s how bubbles happen, and bubbles have the potential to devastate a country’s economy. Witness the housing bubble in the US that popped at the end of 2008. The problem is that when you make an asset easy to obtain, the risk of everyone buying it and inflating its value to unjustifiable levels increases. From the Dutch tulip crash in the 17th century, to the great depression of the 1930s, to the dot-com crash and the great recession of 2009, bubbles have wrecked havoc on economies, decimated whole industries and left millions without jobs or homeless. It is for this reason that central banks around the world don’t want to make money free for banks to borrow, but don’t want to make money too dear either. It is a delicate balancing act.